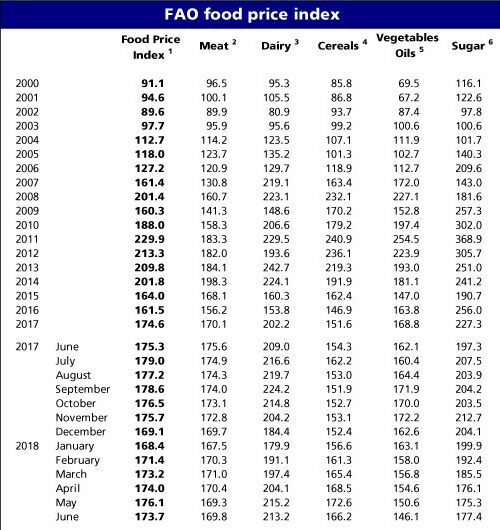 » The FAO Food Price Index* (FFPI) averaged 173.7 points in June 2018, down 2.4 points (1.3 percent) from its level in May, representing the first month-on month decline since the beginning of this year. Most markets have generally taken-on a weaker tone recently largely because of rising tensions in international trade relations. » The FAO Cereal Price Index averaged 166.2 points in June, down 6.4 points (3.7 percent) from May but still nearly 8 percent higher than its level in the corresponding period last year. The decline in June was driven by relatively sharp falls in maize and wheat quotations, while rice prices rose. Despite overall worsening production prospects, wheat and maize prices fell in June, following similar trends observed across most commodities arising from heightened trade tensions. By contrast, international rice prices increased, as supply tightness underpinned higher quotations of Japonica and fragrant rice, outweighing declines in Indica prices. » The FAO Vegetable Oil Price Index averaged 146.1 points in June, down 4.5 points (3 percent) from May, marking its fifth consecutive fall and 29-month low. The drop was driven by lower quotations for palm, soybean and sunflower oils. The continued slide in palm oil prices reflects lacklustre global demand as well as spill-over weakness from the soybean complex fuelled by the recent trade tensions. As for soy oil, further stock accumulations in several countries also weighed on prices, whereas sunflower oil quotations declined on higher than expected production, notably in the EU and Ukraine. » The FAO Dairy Price Index averaged 213.2 points in June, down 2 points (0.9 percent) from May but still 2 percent higher than the corresponding month last year. The decline in June was driven by lower price quotations for cheese, more than offsetting a rise in Skim Milk Powder (SMP) prices, while those of butter and Whole Milk Powder (WMP) remained steady. Increased export availabilities in the United States and the EU weighed on price quotations for cheese, whereas persistent import demand provided support to the prices of SMP. Butter and WMP quotations rose in Europe, but fell slightly in Oceania. » The FAO Meat Price Index averaged 169.8 points in June, up marginally (0.3 percent) from May but still down 3.3 percent from June 2017. 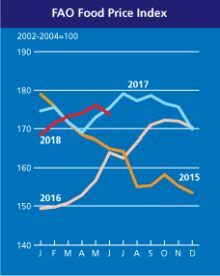 The small month-on-month increase was largely driven by an upswing in ovine meat values as well as a small rise in pig meat prices, while bovine and poultry price quotations fell slightly. Solid import demand, amid weak offerings from Oceania, led to higher ovine meat prices, while firm demand, especially in Europe, supported higher pigmeat prices. Large export supplies from Australia underpinned the decrease in bovine prices, whereas ample export availabilities, especially from Brazil, amid weak import demand, pushed down poultry prices. » The FAO Sugar Price Index averaged 177.4 points in June, up 2.1 points (1.2 percent) from May, marking the first increase after six months of consecutive declines. The rise in international sugar prices was mostly due to worries over sugar production prospects in Brazil, the world’s largest sugar producing and exporting country, as dry weather conditions continued to negatively affect sugarcane yields. Reports indicating higher use of sugarcane for the production of fuel ethanol in Brazil had also lent support to international sugar prices. 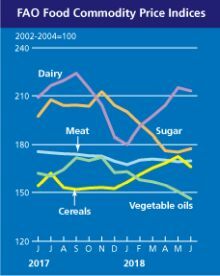 * Unlike for other commodity groups, most prices utilized in the calculation of the FAO Meat Price Index are not available when the FAO Food Price Index is computed and published; therefore, the value of the Meat Price Index for the most recent months is derived from a mixture of projected and observed prices. This can, at times, require significant revisions in the final value of the FAO Meat Price Index which could in turn influence the value of the FAO Food Price Index.